The salt already in the prosciutto should prove quite sufficient. If you are a salter, taste after adding the black pepper and decide if just a touch more is required. If you don’t have prosciutto, use very lean well-trimmed regular bacon or choose turkey bacon. The seasonings are kept minimal to allow both the prosciutto and peas to share the starring role in the dish. You could easily add some thyme or marjoram. A mindful recipe is a template upon which you add in a bit of creativity. Roughly chop prosciutto and onion. Sauté in olive oil over medium heat until the prosciutto only just begins to crisp and onion browns a bit. Add peas and 1 T water. Continue to sauté until the mixture is hot – if the water evaporates, add a little more one teaspoon at a time. Season with freshly cracked black pepper and serve immediately. 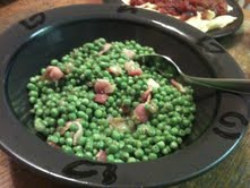 This entry was posted in Beans/Legumes, Side Dish and tagged peas, prosciutto. Bookmark the permalink.